View settings provide control over the display and behaviour of a view. They include annotations, intersections, scale and linked-window controls. To open the View Settings window, right-clicking in a view and choose “Display settings”. The Display tab contains scale and other settings affecting the entire view. When a new view is opened in Insight, it is assigned a colour. This colour is used to highlight the location of this view in other windows. The window icon matches the colour of the view. Click the colour box to change the colour of the view. Tip: To flip the horizontal axis, press Ctrl + R (see Hotkey Menu). In the Horizontal Scale section, define the scale ratio for each of the different horizontal axes (IL and CL). Measurement units will be based on the preferred display unit you have selected in the View menu in Preferences. Select the Lock inline and crossline scale check box to use the same scale ratio for both the horizontal axes. 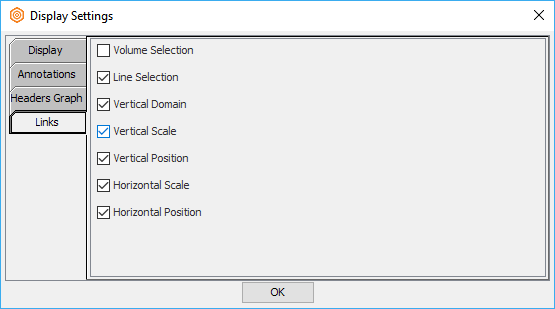 Clear the check box to define different scale ratios for the axes. Click the lock icon to lock (disable) manual zoom on the horizontal axes (IL and/or CL axes) in the section view. 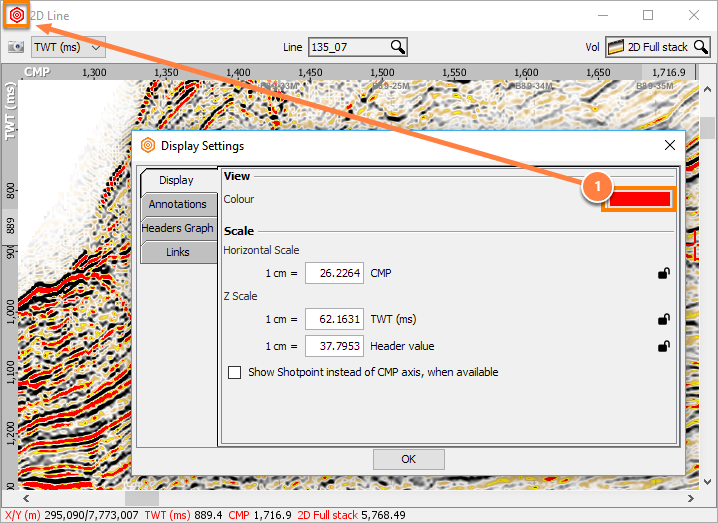 Once you have locked it, you cannot zoom in by right-clicking and dragging on the IL and/or CL axes in the IL/CL View. Go to the Z Scale section and define the scale ratio for the vertical axis (time/depth). Click the lock icon to lock (disable) manual zoom on the vertical axis in the section view. 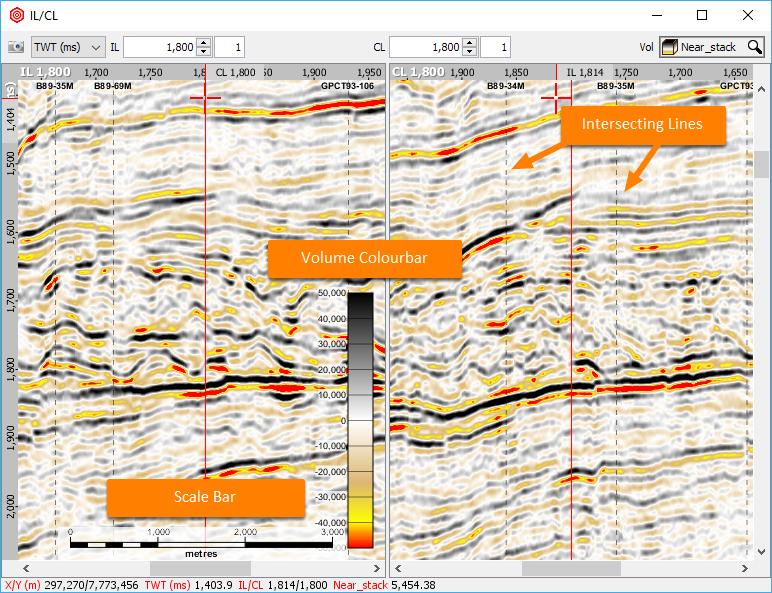 Once you have locked it, you cannot zoom in by right-clicking and dragging on the time/depth axis in the IL/CL View. 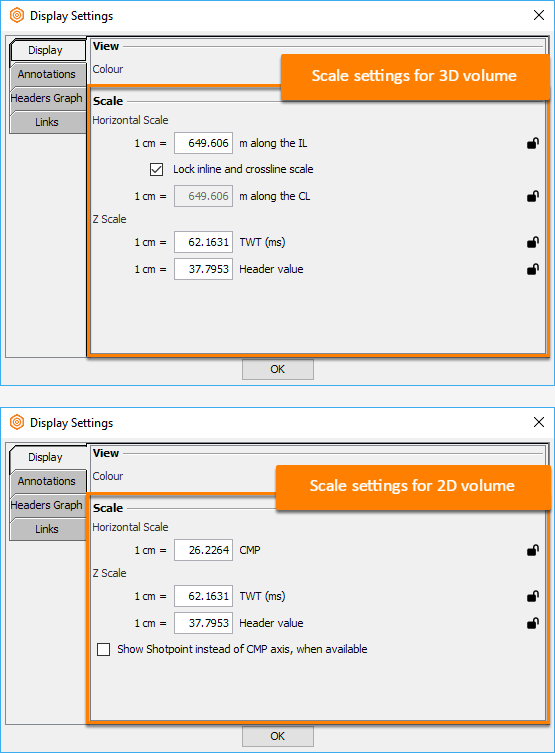 Click OK once you are done with the scale settings to close the Scale Parameters window. Annotations are decorations drawn over a view. These include scale bars, colour bars and markers for intersecting views and lines. Scale Bar : Display a scale bar. Select the position to place the scale bar in the view. The scale bar will use the preferred Display Unit as defined in Control Panel > Tool > Preferences. Volume Colourbar : Display the colourbar for the currently displayed volume. Select the position to place the colourbar in the view. 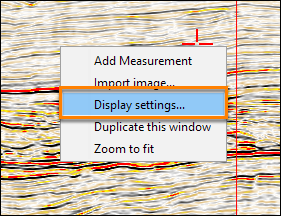 Show first only : When displaying grouped volumes, enable this option to show the colourbar from the first volume in the group. Intersecting lines : Display the locations of intersecting 2D, 3D and arblines. 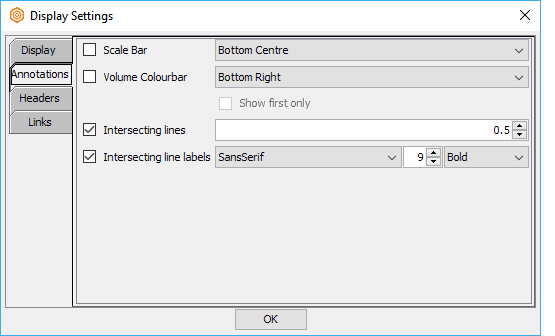 Intersecting line labels : Display and configure labels for the line intersections. Open new views for 2D lines by right clicking and selecting "New 2D view for...". In a 2D view, switch to an intersecting line by right clicking and selecting "Switch to...". Note: To show shotpoint instead of CMP, see Displaying Shotpoint Data for 2D Lines. See Displaying Horizontal Grid Lines (on sections). See Using the Section View Headers Graph. The links tab controls the linking behaviour between views. See Linking Multiple Views.